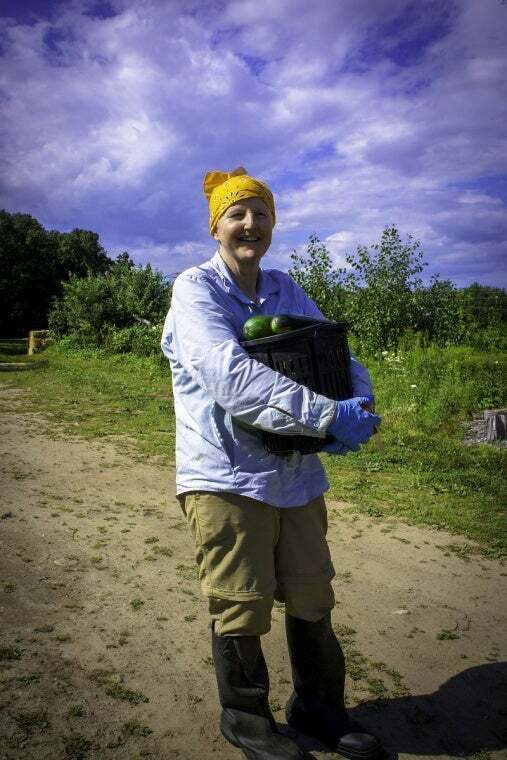 At New Entry’s Smith Incubator Farm site, Renee Rita Toll-Dubois is reaping the benefits of the wide assortment of vegetables she is producing. She is a recent graduate of New Entry’s Farm Business Planning Course and is in her first growing season on the White Rabbit Farm plot at New Entry’s Smith Farm incubator site. White Rabbit Farm yields enough vegetables for Renee to harvest and sell produce to New Entry’s World PEAS Food Hub in addition to having her own CSA shares. In her personal shares, she offers sampling of new or unfamiliar vegetables and then customers may order accordingly to minimize waste and ensure her hard work is enjoyed. She maintains a self-serve cooler pickup as distribution, along with a weekly newsletter featuring the vegetables and their uses. Her colorful array includes amaranth, collard greens, cilantro, kale, parsley, swiss chard, and zucchini to name a few. Renee’s journey to New Entry has been a long and remarkable one. Throughout her life she has been involved with 4-H and environmental education, specifically with connecting urban youth of color with nature and advocating saving farm land for productive agriculture. She had heard about New Entry during its humble beginnings in the late 90’s and appreciated our “commitment and success reaching out and serving everyone”. We remained in the back of her mind. Recently, Renee was looking to expand on her overflowing home garden in Lynn, MA when she remembered New Entry. Our services and support allow “people to come in with almost nothing and launch a farm”. We proved to be a good fit for her needs, wants, and existing job. Like many of New Entry’s new famers, Renee has a job outside of farming. She appreciates her close proximity to other New Entry farmers and our technical assistance staff on the incubator site because it creates a community and opportunities for greater learning. “I learn more about practices and get a broader view being with farmers from different cultures and countries”. By completing the Farm Business Planning Course, receiving support from our technical assistance staff, and physically experiencing her quarter acre plot at the Smith farm site this season, Renee has realistic expectations for herself. Her initial goal was to eventually farm on 5 acres. Now, she sees the amount of produce a quarter acre of land can yield. Renee is taking the time on New Entry’s incubator site to contemplate whether a smaller plot is more beneficial and realistic for herself. After Renee’s third year on our incubator farm, she hopes to take advantage of our Farmland Matching Program and become an independent farmer.